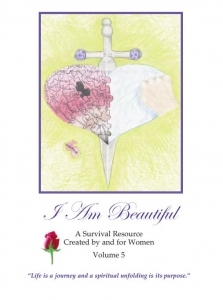 The following blog post was written by a female inmate for Volume Four of the I Am Beautiful book series. The question she asks, “Why did I stay?” is a common thread that runs through many, if not most, of the stories throughout this book series. Numerous incarcerated women have suffered significant abuse. As I grew up, I learned not to speak up about the unpleasant. I tried to be nice, good, patient and long-suffering. So, when I married, I endured the verbal and emotional abuse, but I finally came to understand how as a victim, time after time I drank a toxic drink that my spouse mixed for me, that fooled me because it tasted like love at first. For years I hid my suffering from others. No one guessed the ongoing sadness I felt. I recall the shock I felt after the wedding when I was abused for the first time. I couldn’t believe that someone who said they loved me would be so mean. Finally, with the help of a dream that stayed with me during my waking hours, the bitterness, sadness and anger I kept inside came to the surface. I realized that I needed to face that what my partner did to me for so long was abuse – emotional, psychological, and sometimes physical. Part of the struggle was the internal voice that said, “Don’t dig up and expose all this – it’s not nice. What’s the point, it’s in the past?” But for the sake of my own healing, I had to vomit it out of my system. I didn’t understand why love came mixed with the bitterness of mistreatment. The question that follows was: “Why did I stay and put up with it for so long?” Where was my self-respect? Why didn’t I claim the dignity that was mine as a human being? I was angry with the other person for abusing me, but also angry with myself for going along with it. I could understand that my spouse learned to be an abuser as a child at the hands of dysfunctional parents. After all, I learned from my parents to be nice, not speak up, and suffer in silence. Yet, I also realized that forgiveness is the way out of living with toxic waste, a bitterness that would ruin my own life. But for that I needed God’s help if I was to accomplish what felt impossible. This was written by RE, an inmate, for the “I Am Beautiful” book series Volume 4.